NEW ORLEANS — A company that provided after-school enrichment programs to New Orleans charter schools called DiscoveryFEST helped dozens of local children learn, but it taught a number of employees and contractors a lesson in frustration after the company failed to pay them for their services. Once hailed as an up-and-coming leader in New Orleans education, Sean Tate created the company in 2016. But less than two years later, court records show, that company was spiraling in debt, leaving at least seven employees stiffed. “This is a dream job,” said a woman who worked for DiscoveryFEST last summer. She asked not to be identified for fear speaking out might affect her current employment. The woman worked as a "coach," playing educational games filled with princesses and superheroes with the kids after the school day ended at a local charter school. She said DiscoveryFEST was supposed to pay her monthly, but her second paycheck was days late, and when it came, it bounced. “I would go around the company and I would ask other people, when do we get paid, or do we actually get paid on that date, they was like, 'hopefully'. So, that red flag -- boom -- just pops up,” she said. Lizzie Gentile is another employee who had similar problems getting paid. She started as full-time program manager for DiscoveryFEST in August 2017. “[Tate] had a really great reputation in the community. I think he was beloved by a lot of people, with good reason. He did a lot of amazing work. And he had the knowledge to back it up,” Gentile said. She was excited and enthusiastic to work with Tate, but that employment arrangement ended in disappointment and despair a short seven months later. She and two other former employees, Kelsey Coyle and Maiwenn Raoult, filed a lawsuit against DiscoveryFEST and Tate in Civil District Court to recoup pay they claim they are owed. Gentile's first paycheck, a direct deposit from DiscoveryFEST, bounced, as evidenced by transaction records from her bank. Tate admitted as much, saying another payment had gone out at the same time, leaving the account with insufficient funds. “I felt horrible not being able to look people in the eye and say I don't know where your paycheck is or why it's not here. They're looking to me because I'm managing this program and I don't have an answer,” Gentile said. Tate said he agreed to provide health insurance benefits to Gentile, Coyle and Raoult in November of 2017, according to the lawsuit the three employees filed against Tate and DiscoveryFEST. That lawsuit says Gentile's subsequent paychecks dropped $167.51, the amount she agreed to pay for her share of health insurance premiums. Gentile said she never received pay stubs showing the breakdown of deductions from her pay from DiscoveryFEST or Tate. She said an insurance card arrived from Blue Cross/Blue Shield in December, but three months later, she received a certificate from the insurer saying her coverage had ended Jan. 14. “It was hard to think that you were covered and you weren't. I think I felt a lot more shock than I even knew how to express it,” Gentile said. Coyle was devastated when the three made the discovery. She was 8 months pregnant at the time, in dire need of coverage for her pending delivery. Gentile said the day she received the letter indicating her insurance had lapsed was her last day with the company. The lawsuit claims she never received her final paycheck. Tate insists DiscoveryFEST made the payments to Blue Cross/Blue Shield. Initially, he said the payments were late, but they were made. Then he said a paperwork error caused their insurance coverage to lapse, but said he went down to a Blue Cross/Blue Shield office and straightened it out. He provided a report of alleged payments to Blue Cross/Blue Shield, but no documentation to show the Blue Cross received the payments. The certificate of coverage Gentile received from the insurer states her coverage ended January 14, 2018. Last November, a Orleans Parish Civil District Court judge issued a default judgment in Gentile, Coyle and Raoult’s case against DiscoveryFEST and Tate for more than $42,426.77. That amount includes wages the three women said DiscoveryFEST never paid them for hours they worked. And again, they aren't the only ones who said they had problems getting paid. The woman, who did not want to be identified, said DiscoveryFEST still owes her $625 for hours she worked last summer. Her text logs from a number that appears to be Tate’s show the woman texted him more than 20 times to try and get her final check. Eventually, he gave her a starter check for $625. “I went to the bank and I walked up to the teller and I asked her, can she check to see if this check was legit. She told me the funds weren't available,” the woman said. 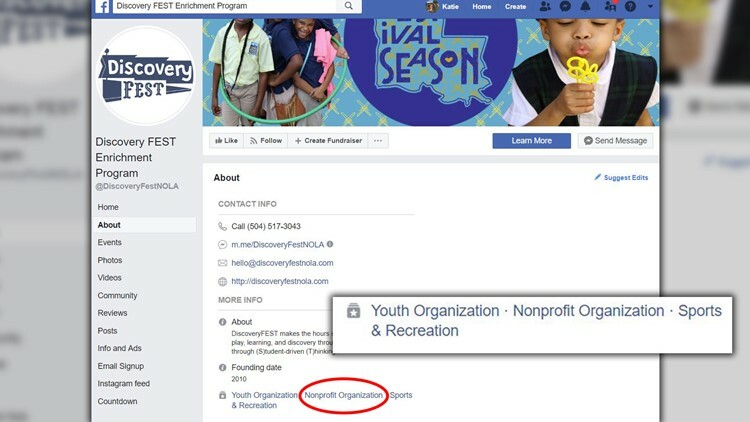 Documents filed with the Louisiana Secretary of State indicate DiscoveryFEST is not a non-profit corporation, even though its Facebook page said otherwise. DiscoveryFEST's website and Facebook page were taken down this week. Tate is the only manager listed in state records and he said he is 100 percent owner of the company. Through public records requests, we found charter schools have paid more than $200,000 DiscoveryFEST since 2016 for its after-school programs. But Tate said that wasn't enough to pay his staff and his debts. Court records show he and DiscoveryFEST have six liens and another $57,277.59 judgment against them from a creditor in Maryland. He disputes he owes that company, Kalamata Capital LLC, any money. As of mid-January, Tate said he's no longer the head of the company he created. “We have a Board of Directors that fired me,” he said. Tate said when he left the company, he believed DiscoveryFEST owed money to four people. “To the best of my knowledge, they had received their paychecks or were receiving paychecks shortly,” he said. But WWL-TV found seven people who say DiscoveryFEST owes them money. That includes the owner of Upturn Arts, a non-profit Tate contracted with to provide some of his after-school programming. A police report says the owner of Upturn Arts reported Tate to the Orleans Parish District Attorney for allegedly writing her $2,665 in bad checks. Police records show the owner of South Coast Code, a local web designer, also reported Tate to law enforcement for writing them $6664.36 in bad checks. Last year, DiscoveryFEST was renting office space from Noble Minds charter school on Carrollton Avenue. The founder of the school, Vera Triplett, said DiscoveryFEST's rent checks bounced and they locked Tate and the company out of the office. Triplett said Tate still has yet to pay up or pick up his things. Tate continued to hire more employees even after court records indicate his company was in financial trouble, unable to pay its debts. The Maryland default judgment was dated February 8, 2018. “We realized we were gonna need to declare bankruptcy in November 2018,” Tate said. The woman who asked not to be identified was hired by Tate last summer. “It's disappointing. It's disheartening. It shows a lack of integrity on his part as a human being,” she said. Tate said he feels bad about the situation. “I feel terrible about it. It keeps me up at night. I'm doing my best to move forward and I don't sleep at night,” he said. Tate said he continued to hire people because he had contracts to fulfill and needed employees to fulfill them. Just two weeks ago, New Orleans College Prep indicated they expected DiscoveryFEST to host after-school programs for them this semester. “We have no schools. All of our schools have either left or we told them we cannot serve them because we cannot hire people because we have no money to pay them,” Tate said. Police records indicate Tate now has two warrants out for his arrest, yet last month, he created another company with the La. Secretary of State called Storyventure Station Incorporated.